Cheela Romaine Smith is a crusty old dyke cartoonist, webmaster, tattooist, and long-term journal-keeper from the Deep South. 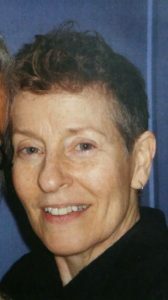 While publishing her cartoon work in alternative comic books such as Wimmin’s Comix, Gay Comix, and Girl Jock in the ’80s and ’90s, she fell in with the underground women cartoonists’ scene. Her graphics have appeared in mainstream publications, as well. She lives in Oakland, California.